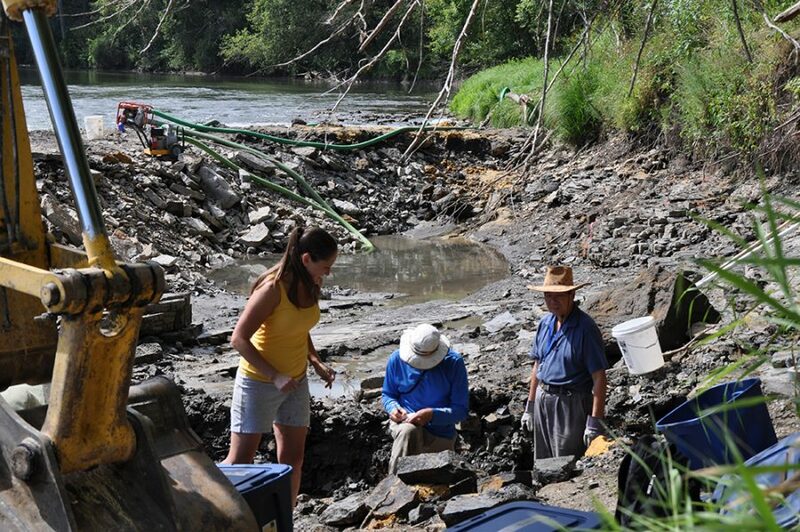 Geologists Carrie Davis, Paul Liu, and Robert McKay complete research at the Iowa River excavation site in 2010. During the Middle Ordovician period around 470 million years ago, a 660-foot meteorite struck where the east side of Decorah now sits, creating a crater 3.5 miles in diameter. Since the impact, geologists have discovered a local shale deposit underneath Decorah that contains the fossils of previously undiscovered ancient aquatic animals. This drew national attention from National Geographic, The Washington Post, and many geologists. Retired geologists Robert McKay and Paul Liu visited the Decorah Public Library on April 3 and Luther College on April 4 to present a lecture on the effects of this crater. The impact of the crater draws attention to Decorah because of its significant contributions to geology. According to Associate Professor of Environmental Studies and Chemistry Laura Peterson, the community has shown an ongoing interest in the geological study in Decorah. 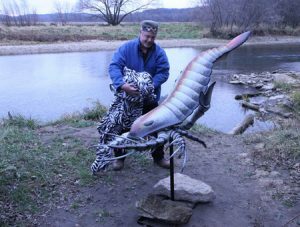 A statue of the Pentecopterus Decorahensis was constructed in Freeport, IA in 2015 along the Upper Iowa River on the property where the discovery was made. During the lecture, McKay and Liu highlighted the geological finds in the Decorah crater. The impact from the crater created the Winneshiek Shale, which is located underneath Decorah and contains fossils from the Middle Ordovician period. The abundance of fossils classifies this shale as a Lagerstätte deposit, which is a fossil site containing remarkable faunal preservation and diversity. The Winneshiek Lagerstätte is characterized by a variety of arthropods, jawless fish, algae, and conodonts, which are ancient agnathan chordates that resemble eels. The shale itself was deposited by an ancient seaway that is thought to be formed after the impact was created by the crater, and led to the preservation of fossils. In the crater, geologists discovered new fossils not currently on the fossil record. One new species of eurypterid discovered is called Pentecopterus decorahensis, named after the town of Decorah by James C. Lamsdell, Derek E. G. Briggs, Liu, Brian J. Witzke, and McKay. This is now the oldest and largest species of Eurypterids. Eurypterids are aquatic arthropods that average over 6 feet in length and resemble sea scorpions. They are the ancestors of modern spiders, lobsters, and ticks. The crater sits 50 feet below the bottom of the Upper Iowa River and is unable to be seen with aerial shots or satellite. It is one of the few records of the missing 20 million years of geology history in the Ordovician period. Many students and community members attended the lecture. Faye Düster (‘22) thinks that it is important to know about local scientific discoveries and how lectures and research projects such as these can improve the Decorah community.